More than just a race bike, this hardtail can descend well, too. 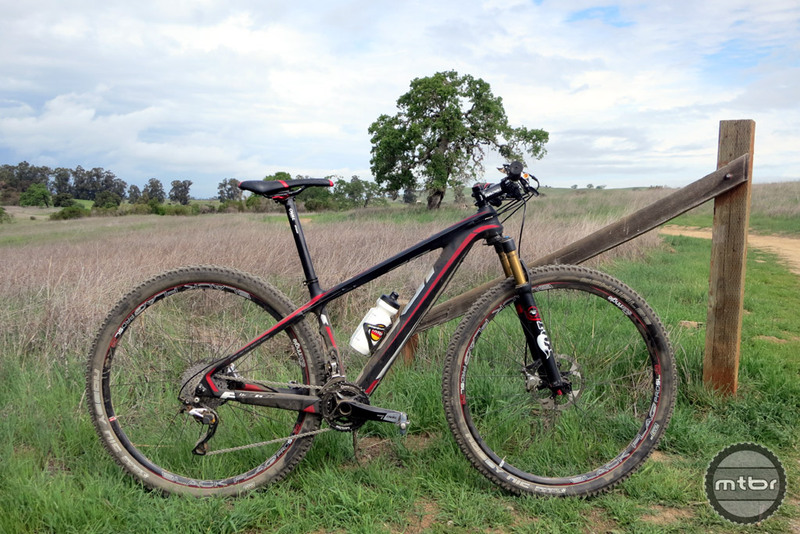 We are very familiar with 29er hardtails from Fuji Bikes having previously reviewed their Tahoe 29 (alloy frame) and older model SLM (SLM stands for Super Light Mountain). 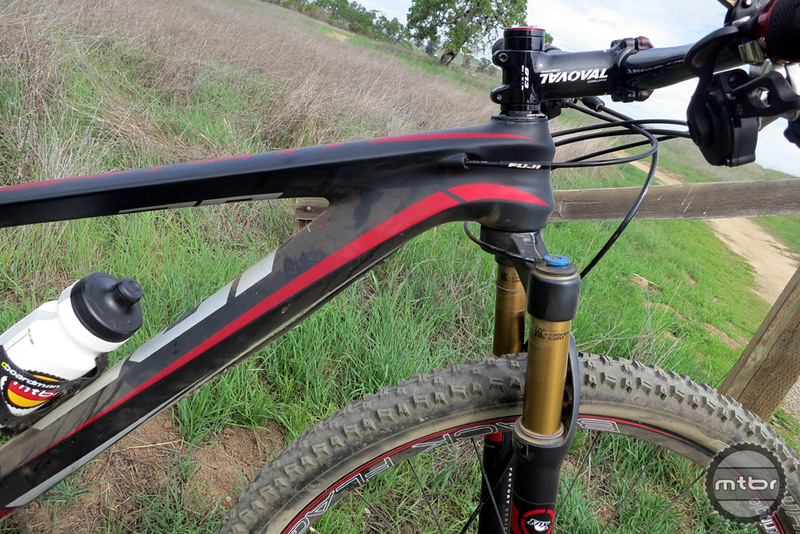 For this year, Fuji made a lot of changes to their flagship 29er carbon racer. The frame material, tube shaping, geometry and stiffness have all been updated resulting in a frame that is lighter, stiffer and more capable than the previous version. It also now has mounts for two bottle cages with the exception of the size small frame (something our reviewers previously dinged the SLM for). The frame itself is now Fuji’s top level c15 carbon (instead of the previous version’s c10) that is constructed with internal bladders to eliminate voids. It is also a monocoque design for added strength and rigidity. The tubes have been reshaped including the ovalized downtube for increased stiffness and power transfer. By refining their carbon molding process, Fuji was able to shave nearly 300 grams from the previous SLM with the frameset weight coming in under 1000 grams. The Fuji SLM 29 has a short tapered head tube which helps keep the front end from getting too high, which is especially helpful for shorter riders and smaller frames. The shorter front end puts the rider in a more aggressive position. The chainstay length is 430mm and helps keep the bike nimble (in a 29er manner of speaking) and the overall wheel base is shorter. The lower standover is again, helpful for the shorter 29er rider. Out back, the SLM 29 uses a 142 x 12mm rear thru-axle that strengthens lateral stiffness in the rear triangle. It also features an asymmetrical seat tube that allows for increased rear tire clearance. All of these changes and updates work together to create a ride that is efficient, light but won’t beat you down for the long haul. The monocoque carbon frame is light, stiff and features nice internal cable routing. 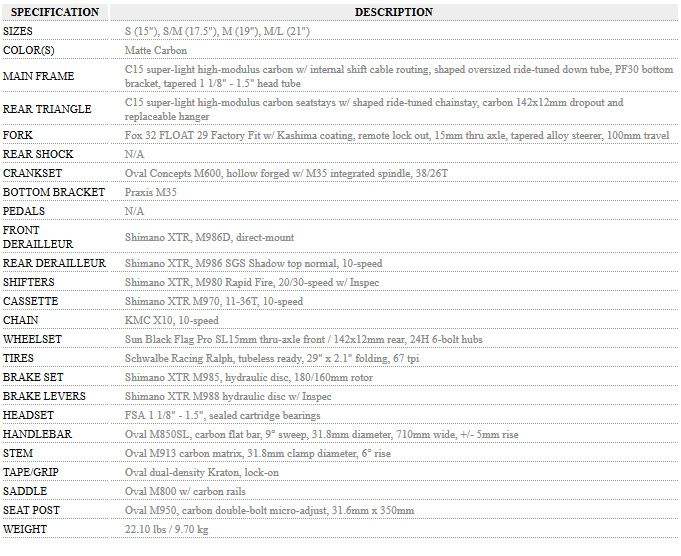 The Fuji SLM 29 1.1 comes in 5 models (1.1, 1.3, 2.1, 2.3, 2.5) in varying build levels with the 1.1 and 1.3 using the c15 carbon and the 2.1, 2.3 and 2.5 using the less expensive c10 carbon. As the top of the line model, the 1.1 has an MSRP of $5799. The SLM 29 comes in 4 frame sizes – S (15″),S/M (17.5″), M (19″), M/L (21″). The model we tested is the 15″. The matte carbon black finish with red and white highlights provides a simple and clean look that is easy on the eyes. Check out this video from Fuji showing the highlights of the SLM 29 and some shots of the bike in action. Suspension duties are handled by a Fox 32 FLOAT 29 fork with CTD that provides 100mm of travel. The 15mm thru-axle keeps the front end stiff and tracking true. One nice touch is the bar-mounted remote lockout and just like everything else, the easier it is to access, the more you will use it. The Descend and Trail mode on the fork works so well that we rarely used the Climb mode. Come race day, you will be happy to have such easy access to the lockout, however. For a bike with such a sharp focus on racing, the 32 Float 29 is a perfect match. Shimano XTR derailleurs, shifters and brakes pair up nicely with the Praxis Works rings and Oval cranks. The drivetrain is mostly top of the line Shimano 2×10 XTR parts with the exception of the Oval hollow forged cranks, Praxis Works cold forged chainrings and bottom bracket and KMC X10 chain. 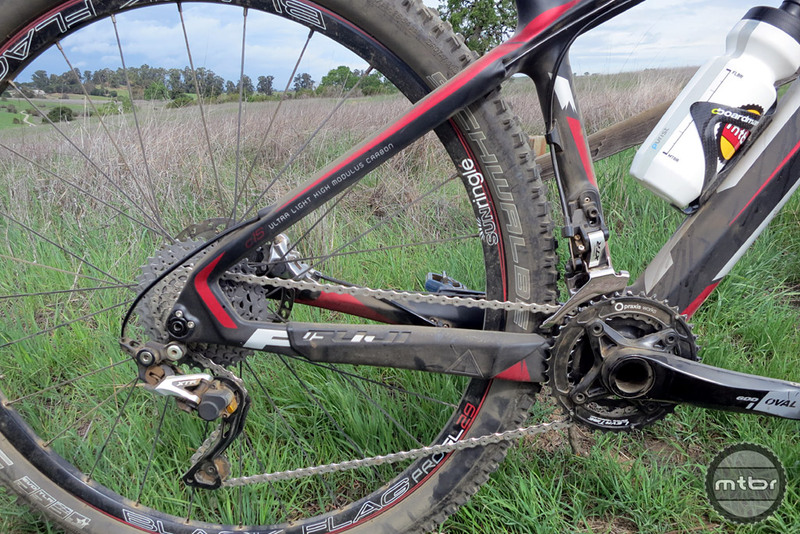 The Shimano XTR disc brakes performed awesome and we had no issues with them throughout our entire long term testing. The inline mounting of the rear caliper (between the chainstays and seatstays) is also a nice touch, this position performs well (stays out of harm’s way) and just looks right. For 2015, Fuji has already changed the spec on their top level SLM from a 2×10 to a 1×11 system, which is definitely the right call for a race-focused bike. Since Fuji Bikes and Oval Concepts are part of the same parent company (ASI), the SLM 29 is peppered with a good selection of Oval components. Oval brand part include the bars, stem, grips (made for Oval by Kraton), saddle, seatpost and the aforementioned crankset. 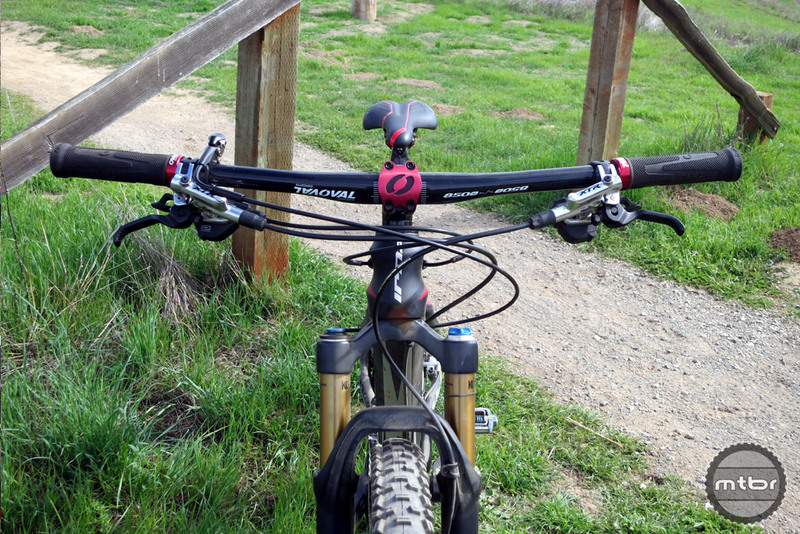 The 710mm bars struck a good balance between leverage and raciness. The long-ish stem shows the race-nature of the bike. The saddle is again, race-oriented and a bit on the firm side. This is one part I would probably change if this were my personal bike. No dropper post here and no quick release either since most racers will want to set and forget when it comes to saddle height. Oval is owned by ASI sports, the same parent company of Fuji Bikes. As we always say when it comes to 29ers, wheels are a key component spec since they can make or break the ride. On the Fuji SLM 29, we were pleasantly surprised at the performance and weight of the Sun-Ringle Black Flag Pro SL wheels. These were truly a standout spec. The hub bearings are super smooth and spin for days. Just pick up the rear of the bike and spin the back wheel for a demonstration. The 15mm thru-axle front and 142x12mm rear kept things stiff. These wheels were not flexy and tracked true even when we didn’t pick the best lines. The Schwalbe Nobby Nics are a good choice for all around trail use as well. Fuji has switched to the more race oriented Schwalbe Thunder Burts for 2015. 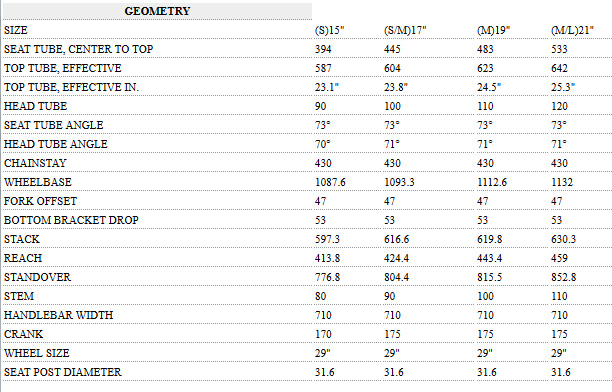 Geometry on the Fuji SLM 29 is definitely race oriented, with a forward weight bias. The shorter rear and longer cockpit keep you in an aggressive position to charge the climbs but at the same time, descending on the SLM is not skittish and is in fact, one of the strong points of the entire bike. If you haven’t ridden a 29er before and you are afraid that it will be too sluggish or ill-handling, the SLM will lay all of that to rest. On the climbs, the short chainstays and stiff rear end allow for an efficient transfer of power and on the descents, the carbon frame and big wheels allow you to carry more speed than on a similarly built 26″ bike. I rode the small (15″) size Fuji SLM 29 1.1 and it was a solid fit for me at 5’5″. Occasionally, I am between a small and medium, but the small gives a more nimble overall feel. The short head tube is welcome to keep the saddle/bar position reasonable and the bike never felt too big. As I’ve said before, 29ers aren’t just for tall riders and riders of all heights should give 29ers a spin. There’s no reason everyone shouldn’t be allowed to feel the climbing and rolling advantages of a 29er. The claimed wheelbase is 42.8 inches on our 15″ and helps provide a stable ride. Our measured weight for the 15″ without pedals is 22.3 lbs which is slightly higher than what is stated on Fuji’s website. This indeed looks like a viable option for smaller riders. I’m about the same height as you and haven’t ridden many 29ers I enjoyed. My main complaint is that I can’t get the bar low enough, but Fuji seem to have this shorted. I noticed in the pics that you hadn’t even flipped the stem! The geometry on this bike is really dialed. Many older 29ers really just didn’t fit short people and the geometry and handling were not good. Not so with the Fuji SLM. I did try this bike with the stem in a negative rise position, but I preferred the handling with the bar a bit higher for descending. I am about tu purchase a Fuji SLM, I am 5’7″ with 30 inseam… I am not sure abouta small or a medium frame… I use to ride a 16″ Giant, then a Medium Giant… and I do prefer the 16″ Giant, however the small frame of Fuji, seems to be a 15″.. what do you think or recommend? Tough question, Rodrigo. The next size up on the Fuji is a 17.5, so quite a bit larger. Was the Giant you were riding also a 29er? Best way to test is to actually size up in a local bike shop, is that at all possible for you? I first rode a Giant 26 wheel size 16″, then moved on to a Giant XTC 29er size M (18).. riding was good but I did not had much clearance and lot of people kept telling me that my seat was too low… but it wasnt… It just looked like that. Also I tought that a smaller size might improve my handling and riding… and now I am very interested to try a Fuji, but cant decide between sizes… I have not a local bike shop that carries Fuji… I read that you are 5’5″ and you are in between sizes… I am in Mexico, and I was planning to order a Fuji, but If you recommend, I will have to wait until my next trip to USA to try on both sizes… now I am actually considering a Tahoe more than an SLM, the Fuji size chart states that I should use a Small, do you still think it is a tough question now that I have considered going to a Tahoe? Hi Tracy,our measured weight for the 15″ without pedals is 22.3 lbs which is slightly higher than what is stated on Fuji’s website.